almond meal chocolate chip cookies. Im always looking for something gluten free to make for friends who avoid gluten, but i don’t always have the ingredients on hand. But I always have almonds, and for these cookies, you just have to blend some almonds in the vitamix, and you are well on your way. I used coconut palm sugar in replacement of the brown sugar, and halved the amount and these were sweet enough for me. I also used grain-sweetened chocolate chips, to keep the sugar down as much as I can. These will make a good little snack when I get a sweet craving in my day – and overall they are pretty healthy for you, and gluten free, and contain no refined sugars! you can find the recipe and instructions here. I whipped up a bunch of these brownies for a holiday party I was heading to and they were a hit! thanks for the recipe, Isa! Will be keeping these in my backpocket FOR SURE! recipe found here, and in her new cookbook! My little guy asked me for cookies. Specifically sugar cookies with clear sprinkles on them. And i found JUST the cookie for him! we did some rolled in sugar, but since were all in the christmas spirit around here, I rolled some in holiday sprinkles too. These are amazing. So soft and chewy. Definitely a hit! In the bowl of an electric mixer, combine the butter and sugars. Beat until light and fluffy. Slowly beat in the yogurt and vanilla. Mix until well combined. With the mixer on low, incorporate the dry ingredients. Beat until you have an evenly mixed dough. Scoop the dough by the heaping tablespoon. Gently roll into a ball. Place the dough two inches apart on a greased or parchment lined baking sheet. Bake for about 15 minutes, or until the cookies are a light, golden brown; crackled on top; and set at the edges. Fourth of july was just here and I used that as an excuse to get some cooking/baking in. I was drooling over this recipe for these whoopie pie smores – and since I had a bag of vegan marshmallows from trader joes, I used this as the perfect opportunity to make them! The original recipe is gluten free, but I didnt have gluten free flour blend, so i just subbed some regular flour and these turned out pretty great!! Its that time of year again where I have rhubarb coming out of my ears and no clue what to do with it besides make pie. So I present to you a crumble. I tried to find something that was refined-sugar free; this was a little tart, but it was pretty good. I think it would be great mixed into some yogurt! The top makes almost like a granola – it was my favorite part. Preheat the oven to 350 degrees. Put the strawberries and rhubarb in a large mixing bowl with the zest, lemon juice, maple syrup, salt, and cornstarch and mix well. Mix the almonds, flour, oats, cinnamon, salt and maple syrup together in a medium mixing bowl. Cut in the coconut oil with your hands or a pastry cutter until the mixture begins to form crumbs. Grease an oven proof casserole or skillet and spoon in the fruit filling. Crumble the topping evenly over the top. Bake for 25 minutes, checking occasionally. When the topping is browned and the fruit is bubbling, remove from oven and allow to cool for a few minutes before serving. My easter tradition seems to be to make a pie. Holidays in general make me want to make a pie. This year I decided to do it on a whim, and quickly found this recipe, which seemed easy enough and I had just enough of everything on hand. I recently bought a can of coconut creme and had it sitting in the fridge, just for a time like this. This came together in no time – and I’m not gonna lie – I had my doubts after I whipped up the peanut butter mousse. BUT when I served it up, it was delicious, together with the pie crust. Its actually pretty hard to believe there is no refined sugar in this pie, and just 2T of maple syrup as the sweetener. I will, for sure, be making this pie again. Line a 7 inch springform or pie form with parchment paper. Prepare chocolate almond crust by pulsing almonds cocoa powder, dates, and salt in a food processor until a sticky mass forms. Press firmly into base of form and place in freezer. Mix peanut butter, coconut cream, and maple syrup with an electric mixer. Beat until peanut butter mousse is creamy and soft peaks form. Remove pie crust from freezer and spread peanut butter mousse on crust using a spatula. Melt chocolate chips in microwave, warm water bath, or double boiler. Drizzle melted chocolate over peanut butter mousse.I also melted some peanut butter and also drizzled this across the top. peach pie with bonus lattice crust! Today marks my 600th post! 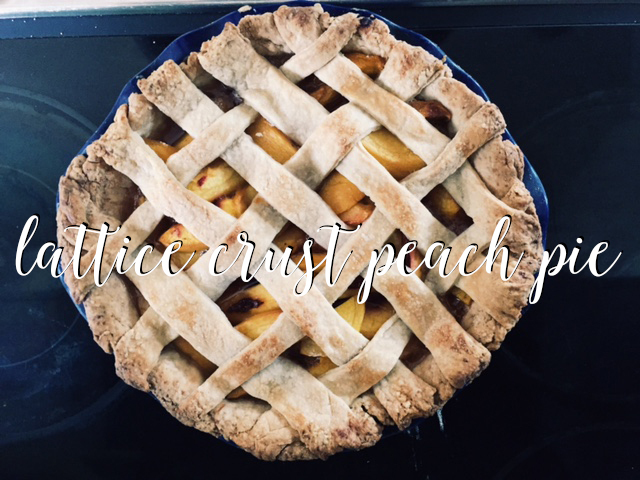 In honor of that huge number I bring you something I had been wanting to do since i started this blog: Make a lattice crust! This has been a bucket item list for me forever, and so glad to cross it off the list. Ive always been too scared to do it – not sure why, it really wasnt any more difficult to do than any other way! Lattice crust for the win! I have made peach pie once before. And with the end of summer nearing us, I made one again. This time I veganized smitten kitchen’s recipe and decided to finally try a lattice crust pie! I dont know why ive been so intimidated, it wasn’t any more difficult to do than making the full coverage pie. I think pie crust in general intimdiates me. I’m warming up to it. This time you poach the peaches too, and i think it softens them a bit, and the result was incredible. This was such a great pie – even milo ate it! Make your pie dough: Whisk together flour, sugar and salt in the bottom of a large, wide-ish bowl. Using a pastry blender, two forks or your fingertips, work the butter into the flour until the biggest pieces of butter are the size of small peas. Gently stir in the ice water with a rubber spatula, mixing it until a craggy mass forms. Get your hands in the bowl and knead it just two or three times to form a ball. Divide dough in half. Wrap each half in plastic wrap and flatten a bit, like a disc. Chill in fridge for at least an hour or up to two days. Meanwhile, prepare your filling: Bring a large saucepan of water to boil. Prepare an ice bath. Make a small x at the bottom of each peach. Once water is boiling, lower peaches, as many as you can fit at once, into saucepan and poach for two minutes. Using a slotted spoon, transfer to ice bath for one minute to cool. Transfer peaches to cutting board and peel the skins. In most cases, the boiling-then-cold water will loosen the skins and they’ll slip right off. In the case of some stubborn peaches, they will stay intact and you can peel them with a vegetable peeler. Halve and pit the peaches, then into about 1/3-inch thick slices. You’ll want 6 cups; it’s okay if you go a little over. Add to a large bowl and toss with lemon juice. In a small dish, stir together sugars, cinnamon, salt and cornstarch until evenly mixed. Add to peaches and toss to evenly coat. Assemble your pie: Flour your counter very well, unwrap your first dough (if the two pieces look uneven, go for the smaller one) and put it in the middle and flour that too. Start rolling your dough by pressing down lightly with the pin and moving it from the center out. Roll until your dough is a 12- to 13-inch circle, then transfer pie dough to a standard pie dish by folding it gently into quarters (making no creases), arranging the folded corner into one quadrant of the bottom of your tin and gently unfolding it to fit over the base. Trim the overhang to one inch. Scoop filling into bottom pie dough, including any accumulated juices Roll out your top pie dough until it is 12 to 13 inches in diameter. To make a lattice-top pie, cut the pie dough into strips anywhere from 1/2 to 1-inch wide with a pastry wheel, pizza wheel or knife. Arrange every other strip across your pie filling in one direction, spacing the strips evenly. Fold back every other strip gently on itself and add the longest remaining strip in the other direction. Fold the strips back down, repeat with the other strips until a full lattice-top is formed. Trim the lattice’s overhang to the diameter of the pie dish’s rim. Gently fold the rim of the bottom crust over the lattice strips and crimp decoratively. To finish:Brush pie with almond milk and sprinkle with sugar. Cool pie: For three hours at room temperature before serving. Sprinkles! peanut butter! oats! chocolate chips!! but really, SPRINKLES!!! Do I need to mention this had me at sprinkles?! 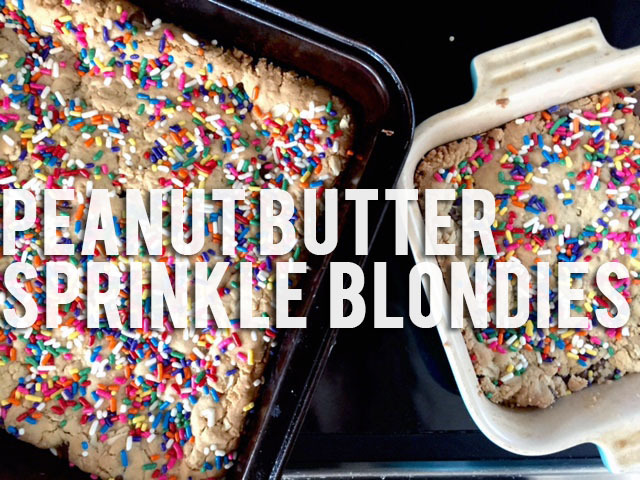 Super fun to make and serve up – anything topped with sprinkles is a winner in my book. Especially when a birthday in invovled. Preheat your oven to 350F. Line a baking sheet with parchment paper. Whisk together the flour, baking powder, soda, salt, and sugar. In a 2-cup measuring cup whisk together the maple syrup, vanilla, almond butter and olive oil. Add to the dry ingredients and beat until almost together. Add chocolate chips and oatmeal. Mix until combined. Scoop the dough into the pan and place on the prepared baking sheet. Flatten slightly and sprinkle with lots of sprinkles. Bake for 20-25 minutes or until set.